Of course pups cuddle, tease and play with each other. And parents do the same with their pups. 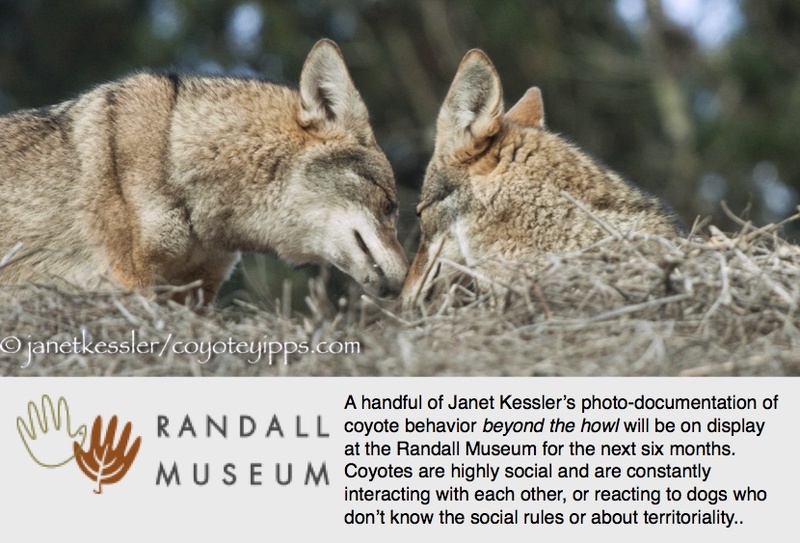 But in the coyote world, these inter-personal activities are prevalent throughout adulthood between mated pairs: coyotes really like each other (unless they really don’t, which is a different story). They are social, meaning they spend a lot of time together interacting with each other, be it simply through visual communication or more emphatically through physical contact. Their involvement with each other is constant and can be intense. 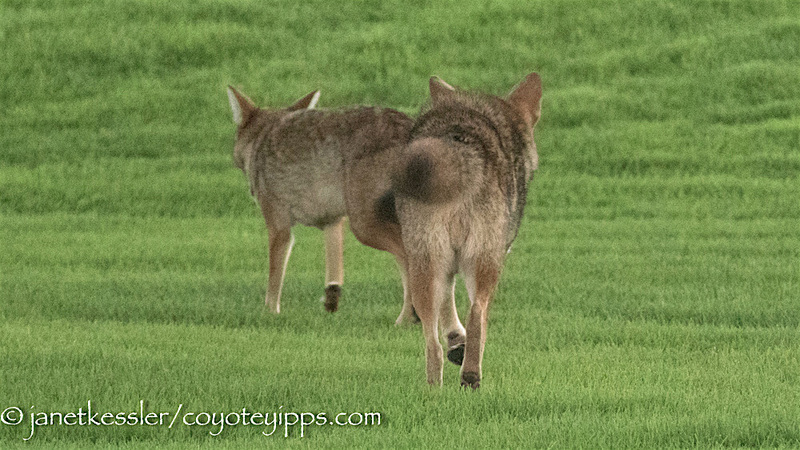 In this video you’ll see some of that activity between a bonded pair. You’ll see affectionate nudges and teasing, fond provocations, tender mouth clasps or little “kisses” and cuddling. This is what goes on between them when they’re left alone and not having to constantly watch over their shoulders for danger — mostly from dogs. The activity occurs throughout the year, not just during the reproductive season. 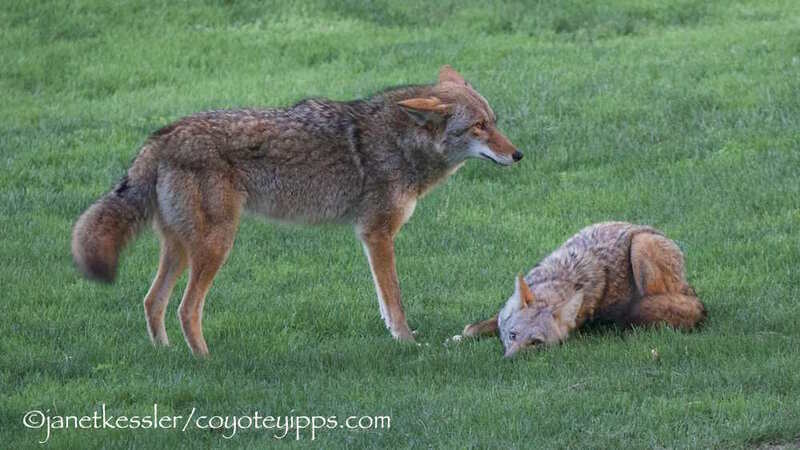 Times in many ways have been hard for this young, two-and-a-half-years old female coyote whom I call Sis. Hard, because she was excluded from her family group by her mother and had to live her life apart from them, but within seeing range, for over a year. Only Dad would come over to console her now and then. 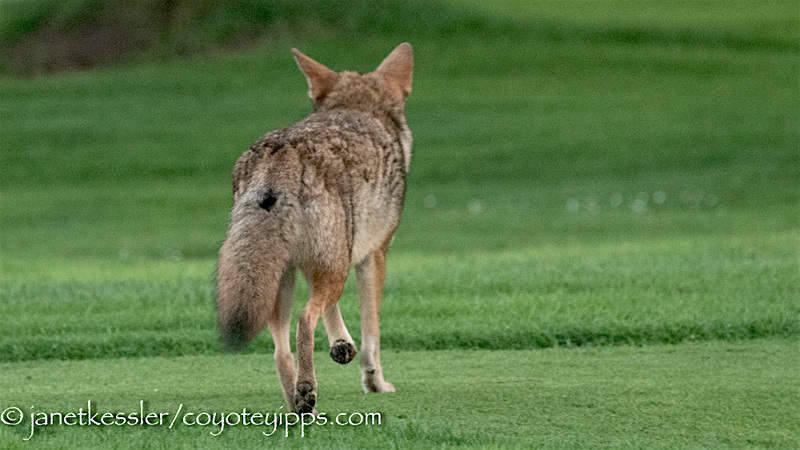 I was sure she would disperse, but a fellow observer told me that this coyote was strong and would be sticking around. I was surprised that this is, indeed, how it worked out. Intruders came through the area several times during this year-long time-frame, and the family drove them out, with this young female right in there helping with that. I felt that she was trying to prove her worthiness to the family, but it didn’t seem to help regain her any acceptance. 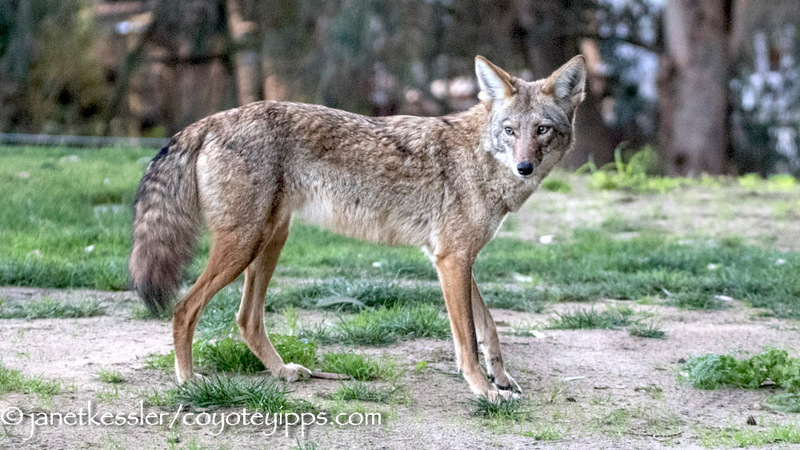 Eventually, a couple of months ago, the family left the territory entirely, leaving her all alone with one younger pup who now, too, seems to be gone. Dad returned regularly to visit at first, but not often. His visits, too, slowly waned and then ceased. I often find her alone, as usual, lying on a little knoll with her chin to the ground. I gather that she looks forward to my appearances because she’s always there as though waiting for me. On this day, after the sirens sounded, she responded while lying down — not even bothering to get up! I recorded the entire howl session, her single voice filling the evening. It was just about dark outside causing the video to go out of focus right at the end of the recording. 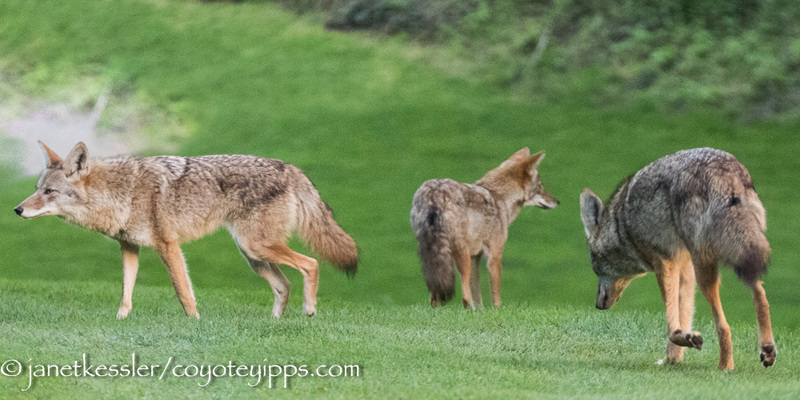 Wishing All Coyotes, and You, Happiness In the New Year! 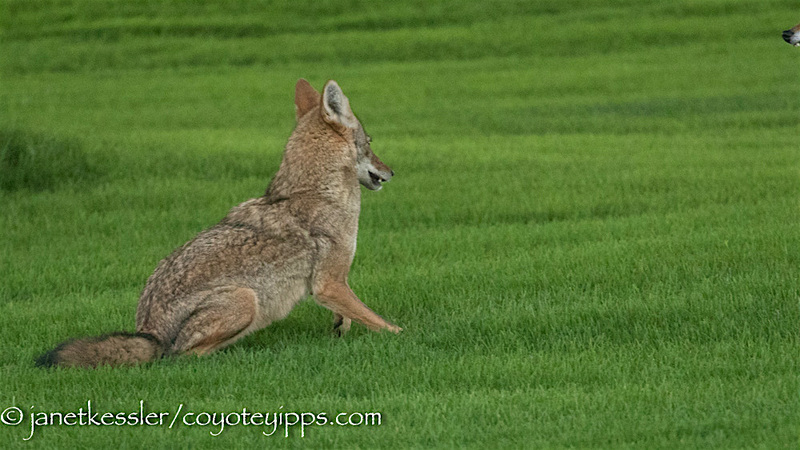 Yes, coyotes can be very happy critters. Seeing is believing. “Blissful” only begins to describe this young gal’s elated wallowing on the old tennis ball she has just delighted in playing with for half an hour. 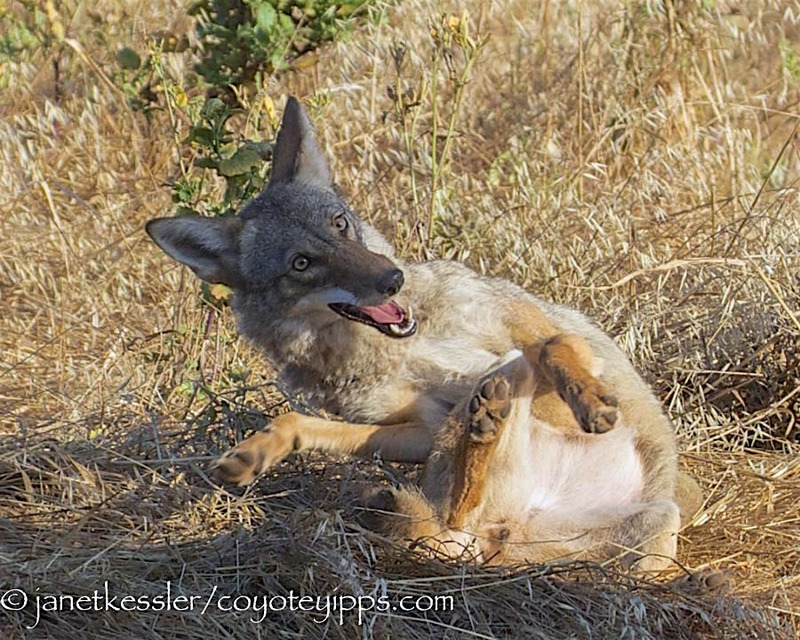 May all coyotes, and you, find this much joy in the new year!